Latest C&W report notes significant growth in Grade A and Grade B office-for-rent space in Q1. 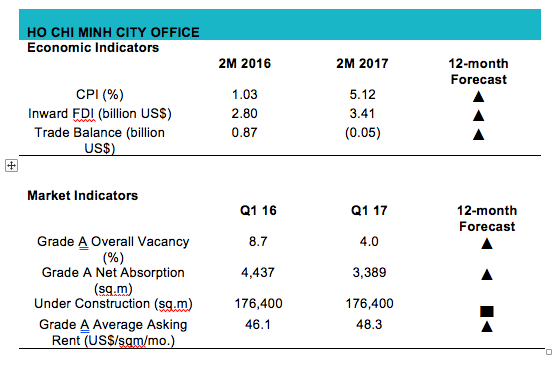 Ho Chi Minh City’s office market is expected to have over 180,000 sq m of new supply in the pipeline, of which more than half will be concentrated in the central business district (CBD), according to Cushman & Wakefield Vietnam (C&W)’s first quarter report on the city’s office market. One Grade B office building was completed in the quarter, supplying an additional 23,000 sq m to the market. There are currently ten Grade A and 51 Grade B office buildings, providing approximately 194,000 sq m and 769,000 sq m of space to the market, respectively. The Grade A and Grade B office-for-rent markets are growing well, the report noted. Occupancy in Grade A increased nearly 2 per cent quarter-on-quarter and 5 per cent year-on-year, reaching 96 per cent. Meanwhile, Grade B recorded a 1 per cent increase quarter-on-quarter but represented only 95 per cent of the figure in the same period last year. The report showed that total market absorption saw a record increase of 29,000 sq m, up 66 per cent quarter-on-quarter and 723 per cent year-on-year. Grade B represented 88 per cent, accounting for nearly half of all new office space for lease. Absorption in Grade A also saw a significant recovery from the previous quarter’s negative level, reaching nearly 3,400 sq m.
Average rentals in both Grade A and Grade B remained stable over the previous quarter but increased on a yearly basis. Grade A rose by 5 per cent and Grade B 1 per cent. According to C&W, there will be 180,000 sq m of new leasing area in 2017, and all Grade A and more than half of Grade B supply will be concentrated in the CBD. Two Grade A office buildings scheduled for completion in the third quarter will provide over one-third of the total new office-for-rent area this year. The market will experience a period of six to nine months where there will be a shortage of supply with moderate rental increases before returning to a tenant’s market in the second half of the year. However, there will also be pockets of spaces becoming available as tenants start relocating, helping to ease the limited supply.